Sometimes Truth whispers conspiratorially; other times it gets naked in public. This was one of those times. On May 31, Truth painted an undeniably clear picture on the front page of section B of the Times Picayune. 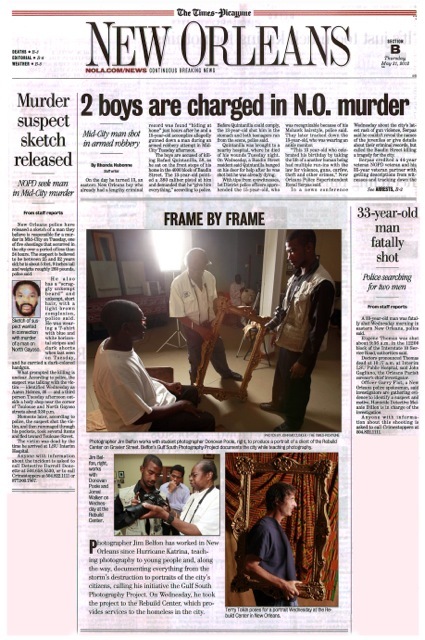 The article headlined “Frame by Frame” is a mini-feature on an event the day before at which four youth from the Gulf South Photography Project (GSPP), from 11 to 21 years of age, produced and delivered nearly 400 individual and family photographic portraits of the homeless at the Harry Tompson Rebuild Center on Gravier Street. The article is inspiring, showing young people making a meaningful impact and GSPP founder Jim Belfon immersed in his twin passions; photography and sharing his craft. But the placement of the article is, in itself, intriguing. It’s framed on the top, left and right, by three news stories about homicides in which the victims and alleged assailants are young Black men. So the GSPP feature is framed in the context of what can happen to and for our youth. In other words, “Frame by Frame” is framed by its frame. We get the picture: crime is rampant and hope is a luxury. But amidst the bad news, we find solutions in artful ways to empower young people and those who jump to the task. Jim Belfon is on a mission to give New Orleans youth a “Choice Of Weapons” (to quote the autobiography of his mentor, legendary photographer Gordon Parks). Belfon's Gulf South Photography Project arms youth with shooting skills and points them towards artistic fulfillment, as they identify careers within the communications industry as their primary targets. To learn more about GSPP's programs and activities, as well as how to support their work, call Jim Belfon at 504 579 4346 or email: jbelfonpch@aol.com.